is just the place to enjoy your Big Island adventure. Conveniently located just minutes from Kona Airport, Costco, and Kailua Kona Town, you won't miss a beat. Great activities, beaches and dining located just 5 - 6 miles away. 3 acre property. It is not unusual that the temperature is 15 degrees cooler than Kailua Kona. During the cooler season , enjoy the warmth of your own electric fireplace with a simple click of the remote. Nature lovers will enjoy the abundant variety of plants and birds that surround the area. Kona has a great open market that offers a variety of exotic fresh fruits and vegetables, and traditional ones as well, that are grown locally, and at a fraction of the price found in the grocery stores. 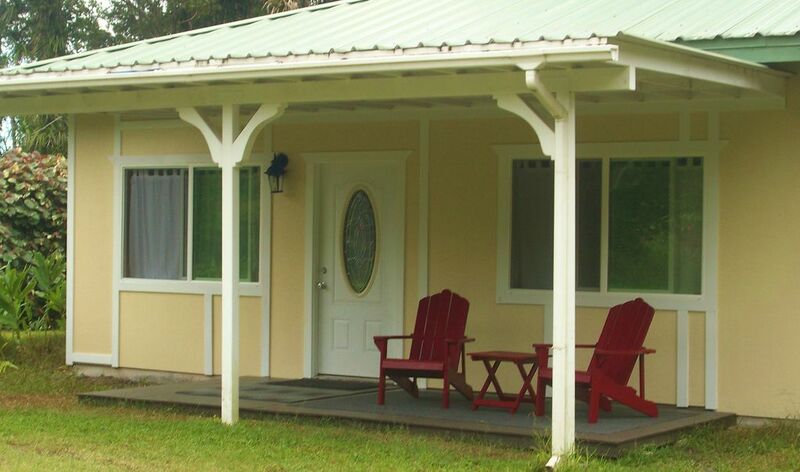 For our friends with limited mobility, the single level cottage is perfect. Park in front of your front door and enter the cottage. No parking lots or parking fees. Towels, toilet paper, shampoo/conditioner, bath gel and hand soap. Located in a cool elevation, on the slopes of Hualalai Mountain. Elevation 2500 feet. In the middle of a tropical rainforest. Kitchen table with seating for 4. Outdoor picnic area seats 4 - 6. Smoking Permitted Outdoors, No Smoking in Cottage.